I have been a tree hugger my whole life. Those Camp Fire Girl roots run really deep. One of the reasons I love reenacting is the earthiness and back to nature and self reliance of it all, and it’s one of the reasons I have been drawn to the Tiny House movement. I was at the first real Earth Day, April 22nd 1970 with my best Camp Fire friend, Dianne. The event was a concert at the town Landfill in Lexington, Massachusetts which was being converted into a park. We rode our bikes there and paid the admission which was a grocery bag (paper not plastic) of crushed cans. It was the first big environmentally conscious thing I did, and right at the beginning of what has become a world wide movement. 45 years later and here I am at the beginnings of another movement, the Tiny House one. All this great stuff that’s important to me really comes together on Earth Day this year- tiny houses, smaller carbon footprint (something I wasn’t thinking about at that first Earth Day), living lightly on the earth, recycling materials for building, self- sufficiency, living history. Wow. 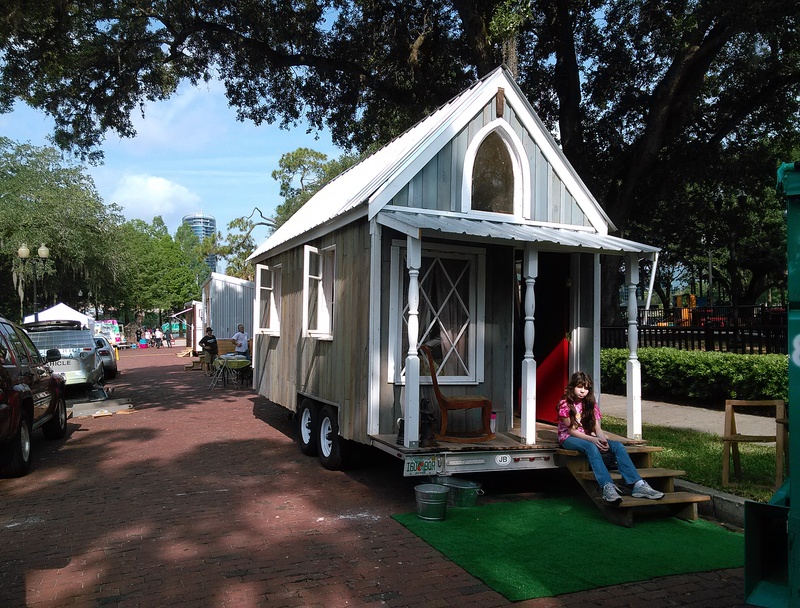 So Earth Day 2015 found me at the Central Florida celebration at Lake Eola Park in Orlando with 2 other Tiny Houses and a bunch of Tiny House friends and several thousands of Earth Day celebrants, most of whom seem much more caught up in it than even me. My house is about 75% finished, and I committed early on to use as much re-use and recycled stuff as possible, I estimate I’m at about 90%. Very Earth friendly. I cleaned out my day to day reenacting stuff because I thought I’d have a few people wanting to tour. Set out the “lawn”, emptied the water tank cause I knew there would be kids pumping water into the street otherwise, and set up for the day. Over 1200 people wanted to tour! I set up at 9am (an hour early) and they were lined up. The event ended at 6, there was still a line. Even after I closed up, hitched it to the truck and was leaving, I had people wanting to see inside. It was really overwhelming. So many people all day asked me what I was selling. Earth Day has really become commercial! (I should have put out a donation jar, but my mind still does not work that way!) My response is on the T-Shirts we were wearing- Simple Life. De-junk, de-clutter, live lightly, simple life. I am not there yet, but it’s a great goal! Anyway, it was a great, rewarding day. Our Tiny House group has been asked back next year- we’ll be bringing a village! !